Pajamas are the one thing you will always need! You have to sleep at some point. So why not look cute and cozy whenever you're getting ready for bed or just having a lazy day at home? These personalized pajama pants are perfect! These pajama pants come in 6 different sizes ranging from XS to 2XL. You will find a size chart in our pictures to help you decide which size will be best for you. The pants are made from a comfy jersey knit material. There is elastic in the back of the pants as well as a draw string at the front in order to be able to change the size according to your comfort. Best part? They are USA made! 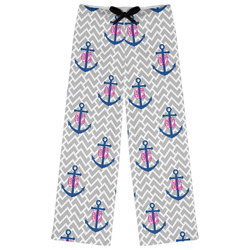 Start designing your pajama pants in our design center where you can choose an adorable or super cool pattern. Find what you like or even personalize and create your own pattern! Be sure to check out our ladies leggings as well! These are another great choice for comfy pants. Go to our Accessories and Apparel section where you'll find scarves and racer back tanks too!